Whether you are a new parent or already have a large family—knowing the best ways to keep your children’s smiles healthy and bright can be confusing. We’ve put together some of our favorite oral hygiene tips to help you navigate each stage of childhood. Establishing good habits at a young age is crucial to a lifetime of healthy teeth and gums. Give your child every advantage in preventing tooth decay by making brushing and flossing a fun part of the daily routine. Begin oral hygiene from the first tooth. Clean tiny teeth and gums with sterile gauze or a clean wet washcloth every day. A small soft toothbrush and fluoride-free toothpaste can be used as your child develops more teeth. Start dental visits early to build positive associations with the dentist. Consider bringing your infant with you to your dental visits, if possible. Becoming familiar with the tooth doctor will normalize dental exams for your child and prevent fear and anxiety as they get closer to their own visits. Bring your child in for the first exam and cleaning by age three. Avoid baby bottle decay! Never put your infant or toddler to bed with a bottle of milk or juice. Make sure he or she finishes the bottle before falling asleep. Otherwise you may see cavities develop before age three. Begin using fluoride toothpaste as soon as your child is old enough to understand how to spit it out, rather than swallow it. Use only a dab or pea-size amount until they are pros. Brush your teeth as a family, whenever possible. This will help establish good habits, as children can model their movements and brushing technique on yours. Set a timer to guide brushing habits. Adults and children should brush for about two minutes, twice a day. A timer is an excellent way to make sure you are thorough in your brushing. Do whatever it takes to get your child excited about oral hygiene. A tooth brush just like Daddy’s? A Spiderman toothbrush? Bubblegum flavored toothpaste? Why not! Each child is different, but positive reinforcement goes a long way toward making brushing an effective habit. Preloaded flossing picks are a fun way to help little ones start flossing independently. Loose floss may be hard to control until fine motor skills are developed. If your child is still learning how to control a pencil and write neatly, he or she may not be ready for loose floss. Let the results speak for themselves. If your children have taken charge of their oral hygiene, it will be evident during their routine exams and hygiene appointments. Always sit in on dental appointments, however, until your child is old enough to drive himself to the dentist! Hormones can affect oral health. Fluctuating hormones during adolescence can weaken oral health. Don’t let hygiene take a back seat when puberty sets in. Intervene if you suspect your child isn’t brushing twice a day, every day. 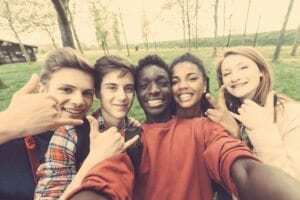 Independence is a wonderful thing, but if they are not brushing and flossing regularly, teens could be on their way to an increase in cavities, or worse. Always use a soft bristled toothbrush. “Medium” or hard bristled brushes can damage enamel and gum tissue. Use the flossing tools that work best for you. It makes no difference whether you use waxed, unwaxed, minty fresh, or Teflon-coated Glide floss. As long as your child flosses every day, using gentle up and down movements, the job will get done. A fluoride rinse can also help keep teeth strong. Though not technically necessary for every child, fluoride-based rinses can be especially helpful when enamel has been exposed to too much sugar, soda, or acidic foods. Just be sure not to eat or drink anything for 30 minutes after rinsing. Bring your child in to see us for six-month exams and cleanings, and we’ll help you understand these and other best practices for caring for your children’s teeth. Your neighborhood general dentist and hygiene staff are oral health experts. We see a lot of families at Metropolitan Dental Care, and we follow a lot of patients from infancy to adulthood. We’ve seen the good and the bad, and are always happy to share our knowledge with you and your family. To schedule a six-month visit with a family and general dentist at our Lone Tree, CO or Denver, CO dental office, call Metropolitan Dental Care at 303-534-2626.